One of the most frequently asked questions by my fellow Americans who are new to spearfishing has to be “is a spearfishing license needed in the US?”. Well, you do. 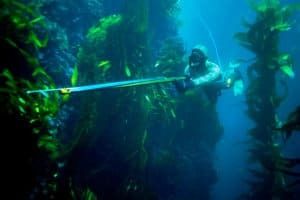 If you’re going use a spearfishing gear like a speargun while scuba diving, you should get a California fishing license from a nearby diving store to avoid any legal hassle. I love eating fishes, and I love adventure sports. Spearfishing allows me to explore both of my favorite hobbies. It’s hundred times more exciting than regular fishing. Almost every weekend, I call a bunch of friends and take a plunge. Spearfishing in the ocean is a lifetime experience. It makes you use your presence of mind and physical fitness to hunt down specific targets. You feel strongly connected to the ocean. Catching the fishes and having them for a feast gives a tremendous sense of accomplishment. In U.S or any other country where spearfishing is legal, all you need is a license to get started. In the United States, you can get your license from dive stores or even online for around $40. Spearfishing without a proper license is a criminal offense and can get you into a lot of trouble. Only recreational spearfishing fishing is legal in the state of California. You will have to be well aware of the restrictions regarding fishing in the protected marine areas and conserved species before applying for a license. 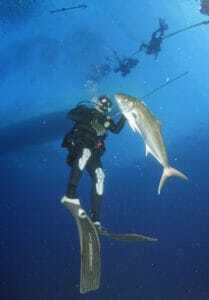 Recreational fisheries for California Scorpionfish, white sharks, Spiny Dogfish and other such federally managed groundfishes are available for freedivers and shore-based anglers all year round as far as I know. For boat-based anglers, it will be opened from March. It is important to remember that no other fishing gear except spearfishing equipment are allowed on the vessel and while spearfishing. You don’t have to keep the license with you unless you’re a boat diver. If you want to taste the real thrill of spearfishing, get a license that provides freshwater fishing privileges with the “ocean enhancement stamp”. However, that will not come cheap but is worth the money if you want to spearfish in the ocean. I always bring my license down to the beach. My suggestion is to buy a bag with a waterproof ziplock. If you’re not a local and planning only a short trip to California for spearfishing, you can apply for a short-term license. On the other hand, a lifetime rec spearfishing license will cost you around 500 bucks. Both Florida residents and out-of-state spearfishers require permits to indulge in fishing sport. Carrying your license with you during the activity is a must. However, natives below the age of 16 or above 65 do not require having any license. All you will need is a valid ID proof to enjoy license-free spearfishing if you’re a minor or senior. But this does not apply to alligator hunting. Non-resident seniors will not need a recreational fishing license if they are fishing from a licensed vehicle like a chartered vessel or with a chartered captain. The “food stamp” exemption only applies to residents who will be fishing from the shore. There are other exemptions as well. You do not need a spearfishing license if you are hunting in freshwater in the county of your residence on your, you parents’ or spouse’s homestead. Members of the Armed Forces of the United States and other active military service members can also enjoy spearfishing without license. Also, hunting in a private land does not require any license. For partially or fully handicapped people, Florida government has introduced Florida Resident Disabled Person Hunting and Fishing License. The non-residents should remember that out-of-state spearfishing licenses will not be valid in Florida. You will need a saltwater fishing license to hunt any native or non-native aquatic animals such as crab and lobster. If you’re new to spearfishing in Florida, take my advice and fish from a pier which has a valid pier saltwater fishing license or from a “recreational saltwater vessel” licensed vessel. Hawaii is one of the most popular freediving and spearfishing destinations not just in the United States but the whole world. 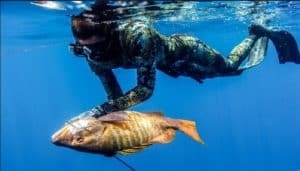 Except areas belonging to Marine Life Conservation Districts, there’s no such restriction on spearfishing in the oceans of Hawaii for both locals and visitors. However, there are certain regulations related to using specific spearfishing gears. Although you don’t require any marine fishing license, having the Hawaii Fishing Regulation booklet will come handy. However, if you are planning to sell the catches, you will require a special permit. Puerto Rico is a beautiful place in the U.S territory to indulge in recreational spearfishing. The island is known for its exquisite beaches and has many organizations offering pocket-friendly spearfishing trips. Spearfishing without a license is strictly prohibited here. 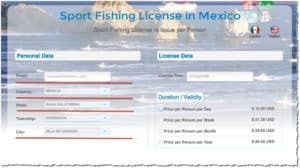 You can easily read all the rules and regulations related to spearfishing permit on http://fishinglicense.org. For a resident, getting a license here is a walk in the park. All you’ll need is a valid proof of residency and some other documents. However, individuals below 18 or above 65 are exemptions. Like most other states in the U.S, you won’t need a spearfishing license if you’re hunting from a pier that holds a valid pier license or from a properly authorized charted or party boat. Puerto Rico offers three types of Lifetime Sportsman License to make the license holders eligible for freshwater fishing for a lifetime. If you’re a resident and do spearfishing regularly, this would be the best choice for you. If you’re a visitor, you can enjoy spearfishing in salt-water without a license on Free Fishing Days so, plan your trip accordingly. The fish and wildlife conservation of Puerto Rico organizes several recreational spearfishing programs throughout the year. If you’re going to dive from a boat, you have to make sure everyone aboard carries sports fishing license with him or her. Keep in mind that there is a very strict prohibition against killing conserved marine animals like turtles and marine mammals. You cannot use your spearfishing license for the trading of fishes or filleting the games on the vessel using which they were captured. Well, the good news is you don’t need any license to fish from the shore. But the distance has to be 250 meters or more from the swimmers. Provided that, I would say the best time to start spearfishing at the beach of Mexico would be early morning. To be honest, it is hard to give any definitive information regarding the licensing without visiting there. Consulting a local fishing guide, I think, would be a great decision. Many of my friends have been to Playa. According to them, the guides are really knowledgeable and will let you know whether you need a license or not based on what kind of fishing activity you choose. Spearfishing is a very popular form of water sport all over the U.S. Procure information about the sportfishing regulations of the state you’re planning your trip before purchasing a license. Not to mention, always get your license from an authorized personnel or organization. Hope this article cleared your doubts to some extent.